Jesus Larios pushed himself out of his comfort zone and into a job as a ball boy for the Chicago Bulls. 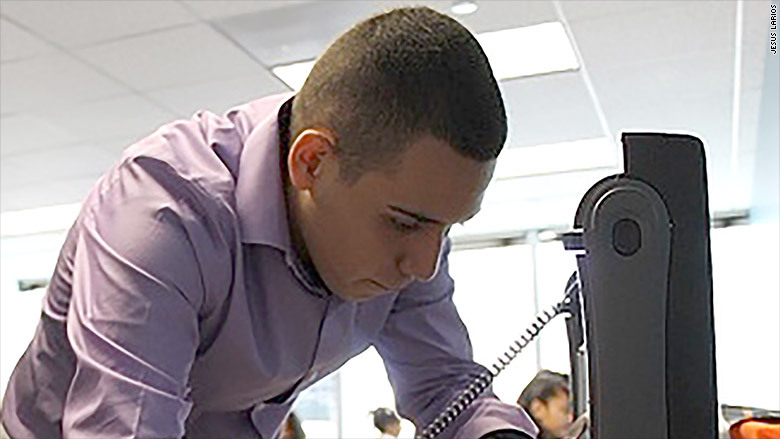 Growing up in Chicago, Jesus "Jesse" Larios figured he'd end up working a dead-end job just like everyone else he knew. His parents immigrated from Mexico -- his dad works at an auto parts store and his mom doesn't have a job. One older brother never finished high school and is employed in a factory, while his other brother works sporadically in construction and other jobs. To get to this point, however, has taken a lot of initiative. Not only has Larios had to learn the most basic of professional skills: How to shake a hand. How to hold a conversation. How to be on time. But he has also sought out opportunities wherever he can. 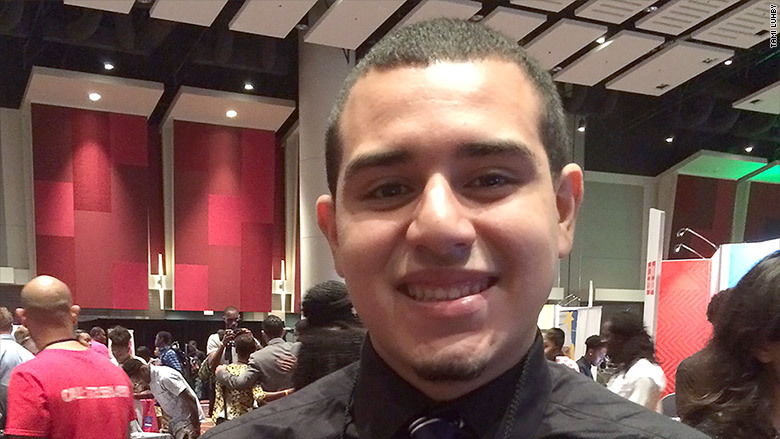 In his junior year, Larios applied to Genesys Works, a selective program that prepares underprivileged high school students for the corporate world and places them in internships. The summer skills sessions were demanding. Shy by nature, the program challenged him to overcome his nervousness in professional settings. One time, Larios had to walk up to a stranger, shake hands and start talking to them. Another time, he had to sing a lullaby in front of his peers. And he had to stand before the classroom and come up with a 30-second speech about a single word thrown at him by Genesys staffers. "When I first started [at Genesys], it was like I was in two different worlds: my normal life and the professional world," said Larios, who also studied information technology at Genesys. "Eventually, it became who I am. I can do so much more than I originally thought." Larios transformed that summer. Initially, he was so quiet, you wouldn't know he was there, said Khalfani Myrick, the program's manager. As Larios successfully completed assignments, he grew more confident. "Any time he sees an opportunity, he will take it," said Myrick. Most students wait for Genesys to assign them a work site, but Larios asked to be assigned to Rush University Medical Center's IT department. He replaced monitors, fixed computer problems and helped employees with Internet issues, earning $11 an hour during his senior year of high school. "I never thought I'd be working in a place where you need an ID to open doors," said Larios. Larios fixes computers at Rush University Medical Center. That ID also gave Larios access to what he really wanted from Rush ... the sports medicine department, where the doctors and physical therapists for Chicago's biggest sports teams work. But when Larios went to the physical therapists' floor, they shooed him away. He called a few of the doctors, but they never got back to him. He then wrote a letter to Dr. Brian Cole, team doctor for the Chicago Bulls and the White Sox. In it, he told the doctor of his goals. Cole, so impressed by the letter that he later showed it to his own teenage son, and invited Larios to observe several surgeries. 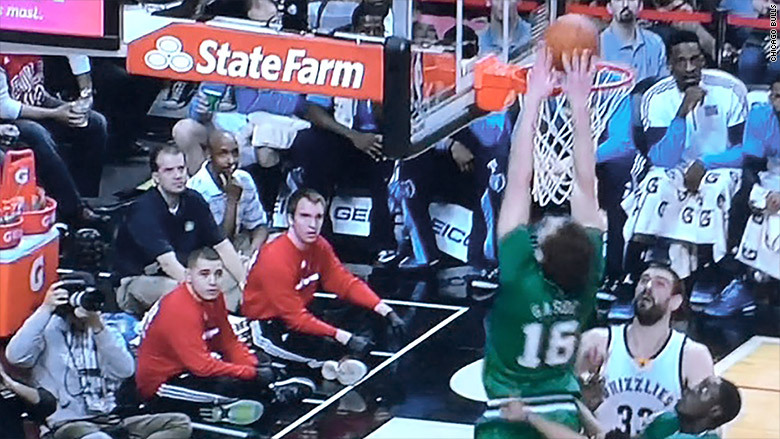 Struck by Larios' self-esteem, perseverance and passion, Cole recommended him for a ball boy position with the Bulls. "He's had no advantages or opportunities other than what he's creating for himself," said Cole, who continues to keep in touch with Larios via email. "He's as capable as anyone. He just needed access and he took it from there." Larios, second from left, in red, sits courtside at a Chicago Bulls game. In this dream job, Larios helped with warm-up drills, ran errands for the players, gave them towels during the games and prepared Gatorade. He talked about his plans with the trainers, who suggested he major in athletic training and pursue a master's degree after college. Initially, he wasn't assigned to that many games. So Larios started getting there two hours before his start time for his "supervisor to see how bad I wanted this and how much this job meant to me." He ended up on the roster more often. Larios, however, realizes he still needs more advice on handling situations on the job. Now he's a scholar with One Million Degrees, a non-profit program that supports community college students. It hooked him up with a coach, Leandro Martinez, 27, who has worked in conference planning and digital marketing. 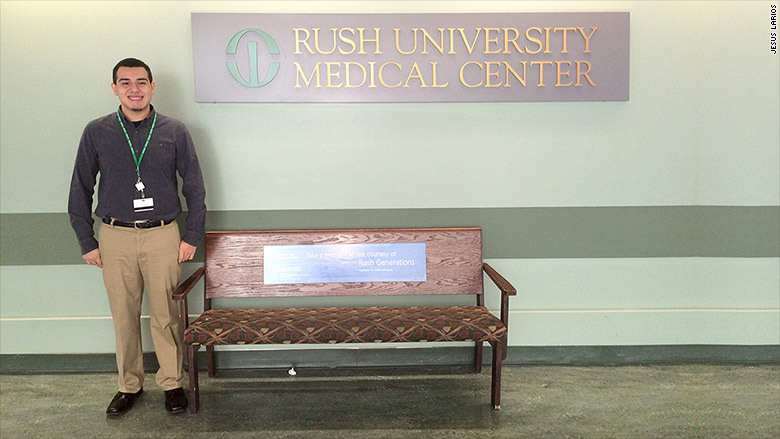 Jesse at his job at Rush University's Medical Center. One of Martinez's best tips: Get to know your co-workers. Get to know what motivates them, how they think and what their needs are. Most importantly, find out what value you can bring to them. "If they don't know you and don't have a connection, they'll forget about you and not care about you," said Larios. Larios hopes to get rehired by the Bulls when the pre-season starts in October (UPDATE: He will be working with the Bulls again this season). Meanwhile, he'll be juggling four classes at Malcolm X, where he intends to raise his 2.9 grade point average. He also plans to get a part-time job, ideally in an office or at a non-profit helping at-risk youth. This doesn't leave a lot of time for friends or sleep. He only gets between three and six hours a night during the week. "Once you get a taste of the life you could have, you'll want to work hard so you can have that life," Larios said.